GUYMON, Okla. – The men, women and children who settled in this land more than a century ago were rugged. They needed to be. The terrain can be rugged, and the climate tough on those hoping to grow crops and raise livestock. It’s because of those hearty folks and the lessons learned over the decade that this Oklahoma Panhandle community continues to thrive. 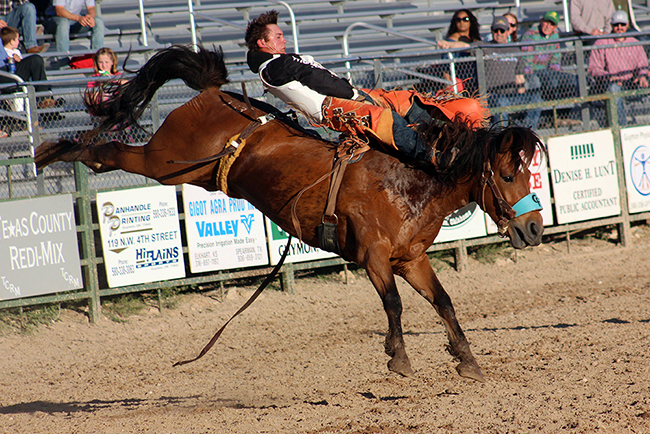 The legacy continues through the annual Pioneer Days celebration and the Pioneer Days Rodeo, set for 7:30 p.m. Friday, May 4; 2 and 7:30 p.m. Saturday, May 5; and 2 p.m. Sunday, May 6, at Henry C. Hitch Pioneer Arena. It will be home to nearly 1,000 contestants over the week of competition a true indication of what this event means for the cowboys and cowgirls who make their living in the game. “This is one of those rodeos that just kind of keeps the tradition alive,” said Trevor Brazile, a 23-time world champion from Decatur, Texas. “I love it. He’s one of only two men to have qualified for the National Finals Rodeo in all four roping disciplines: heading, heeling, tie-down roping and steer roping. He has earned Montana Silversmiths gold buckles in all but heeling and owns the most all-around world titles with 13. A year ago, he earned the Guymon all-around title again, pocketing nearly $7,200. It’s just further proof that he and many others find Pioneer Days to be the perfect home the first weekend in May every year. This year’s team roping will feature the return of hornless steers that are considered “fresh,” because they have never been through the chute system or pushed into an arena. They will come straight out of a pasture to the rodeo grounds. It makes for some wild action to an already wild rodeo. This will be the first time since 2007 that the team ropers will compete with the muleys. It just adds something else to this rodeo that has been around for 86 years. In addition, John Harrison, one of the most decorated clowns in the game, returns to entertain the Guymon crowd. Part of that comes through Pete Carr Pro Rodeo, the Dallas-based livestock production company that not only features some of the greatest bucking stock in the game but also has been a staple for this rodeo for the last decade. Carr has been nominated for Stock Contractor of the Year five straight times. It’s not just the bucking stock that makes for an entertaining rodeo. The timed-event contestants come from all across the country to take their shot at winning the Guymon title. “It would mean a lot to win the all-around here,” said JoJo LeMond, an eight-time NFR qualifier (heading and steer roping) from Andrews, Texas. “Anytime you can win the all-around at something like Guymon or Cheyenne (Wyo.) or Salinas (Calif.) – somewhere that it’s a cowboy event – that’s great. You’ve got to be mounted well.